Xiaomi said back in December that the Mi 7 will arrive at MWC 2018 with a Snapdragon 845, but according to some rumors, the company is postponing the announcement and bringing the Mi Mix 2s instead. 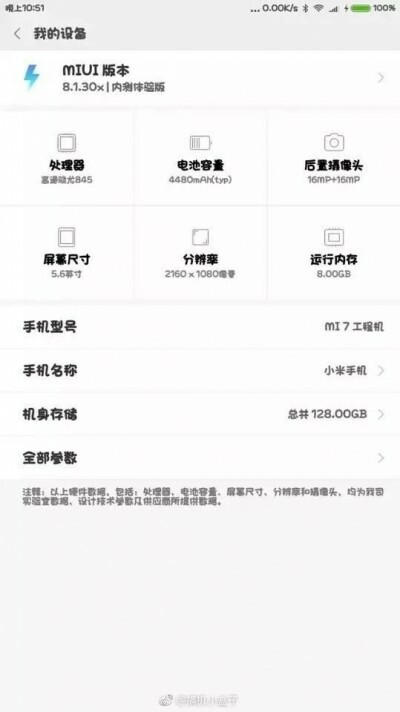 Still, a leaked screenshot of the Mi 7, said to debut in April, suggests 8 GB RAM and 4,480 mAh battery, a massive upgrade over the Mi 6’s 4/6 GB RAM and 3,350 mAh power cell. Other specs reveal the already known Snapdragon 845, a dual camera setup (16 MP + 16 MP) and 5.6” tall screen with FullHD+ resolution. The storage is listed as 128 GB. The screenshot says that the user interface version is MIUI 8.1.30x, which means the build is from January 30, 2018, not an old UI version. The company already updated 40 devices, including some 5-year old Mi phones to MIUI 9, so it's impossible the Mi 7 will run anything but that.